The reputable polling firm Ipsos MORI has published the results of its latest EU referendum phone poll and it makes for yet even more fantastic news for the Leave campaign. The campaign for Britain to pull out of the 28-nation bloc has a six-point lead (53/47%) among respondents who are certain to vote. It’s also the first time since David Cameron promised to hold a referendum back in January 2013 that Leave has led in one of Ipsos MORI’s monthly polls. Putting it simply, it is a sensational result in what has been a sensational week so far for Brexiteers. In what ought to be a massive worry for Remain campaigners, public opinion has taken a significant shift towards a Brexit over the past week. This new Ipsos MORI poll — that was conducted for the Evening Standard newspaper — is the fourth this week to show a lead for the Leave campaign. Even among all participants — not just those who are certain to vote on June 23 — Leave had a two-point lead (51/49%). This is important because even when Remain has been behind with those who are certain to vote in past polls it has usually still been in the lead among all respondents. It is also the latest survey conducted over the phone to give a lead to Leave after months of phone polls consistently indicating leads for Remain. Importantly, Ipsos MORI was also one of the most accurate pollsters when it came to predicting the outcome of the Scottish independent referendum. 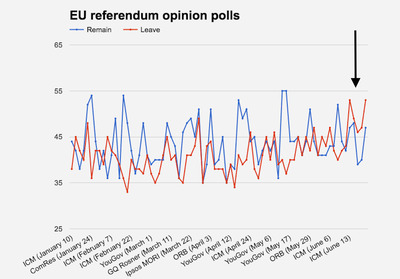 This is what Ipsos MORI’s latest survey means for Business Insider’s live EU referendum opinion polls chart. 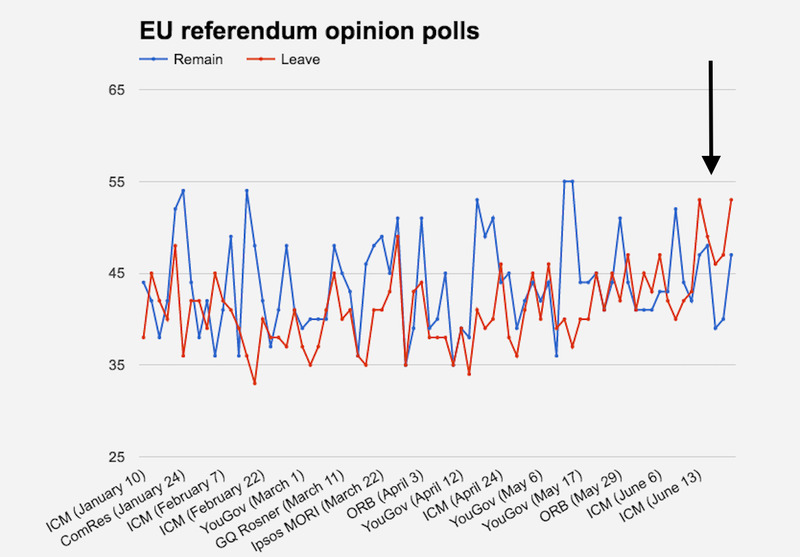 As the chart illustrates, public backing for a Brexit has surged over the past week. As Business Insider said earlier this week, this pro-Brexit swing is not a blip. It is a very real statistical phenomenon and it couldn’t come at a worse time for David Cameron and co with just one week until the referendum. A swing is taking place in the EU referendum betting market, too. After months of Remain being the overwhelming favourite, William Hill estimated earlier this week that Leave will be the most likely outcome by the weekend. More opinion polls are expected to be published this week by Survation, ComRes, and Opinium.